When I found out my friend Ginger's wedding shower party was going to kick off with a knife skills class at Culinaerie, I was in foodie blogger heaven. A) I've already taken a knife skills class with Olga from Mango Tomato, so I was sure to be a star student and B) I've been dying to try out this cool new cooking school in DC. Much to my abject horror, I found out that in the class we'd be learning to debone and cook a whole chicken. A. Whole. Chicken. Anyone who knows me knows if there's one thing that freaks me out, its chicken. I get that I'm a bit irrational about it. Especially when I'll take down a soft shelled crab or eat sushi without a second thought. But chicken's one of my culinary Achilles heels. If it wasn't for this blog and you reading it, I might have bailed or at least bagged that part of the class. But I started thinking about when in Kathleen Flinn 's book her teacher at Le Cordon Bleu in Paris tells her they must learn to taste and cook everything... even things they don't like. As a chef, he says, what you are asked to cook is often out of your control. So I decided to embrace the chicken, so to speak. I may never do it again, but by God, I would learn to do it. Class started out perfectly... I met my friends there and was excited to discover that friend and fellow food blogger Arianna Levitus from Don't Forget The Flour was assisting the teacher, Chef Susan Holt. The work space is clean and chic. For a 10am class, we were delighted there was coffee. We started off with an overview of types of knives and Susan demonstrated what each were for. She reinforced the meanings of julienne, dicing, mincing and all types of new cuts that I can't wait to try in my recipes. And then... the chicken. You could baste or marinate this bad boy and put him on a grill just like this. (Toss the backbone or use it to make chicken stock). We were going to be sauteing ours in a dijon, wine and cream sauce, so we further broke ours down into the 2 breasts and 2 thigh/leg pieces. From there, we added a little canola oil to our pan and cooked them skin side down until they began to brown (about 4 minutes). One great tip Susan shared was that you shouldn't move them around and mess with them. Leaving them in one place in the oil allows the skin to crisp up. We then removed them from the heat and allowed them to set. Another great tip we learned was that for every pound, your meat should set for 10 minutes before it is served. We then moved on to the sauce. You all know I can rock a wine and cream sauce and that's not the topic of this post, so I won't go into detail. Suffice to say, the chicken goes back into the sauce and simmers for another half hour to soak up the yumminess. We pulled it out, served it over a bed of rice, reduced the sauce by half and poured it over. The finished product wasn't half bad for a gal who has steadfastly not touched raw chicken in years. Thanks to Culinaerie's Chef Susan Holt for her humor, patience and advice -- and for Arianna for sneaking me a little extra wine to calm my nerves! I would highly recommend Culianerie for showers, parties, or even just popping by on your own for a class. It was so much fun and I learned a lot. Check out Culinaerie's class calendar, "like" them on Facebook or follow them on Twitter to get the latest news and events. Congratulations! Three cheers to you for facing your fears. I adore Susan Holt. We had an event there last year and will be back this July with one of our top Baltimore chefs. I feel certain we will meet one of these days. Kindred cooks. Kudos to you! I should probably take this class. 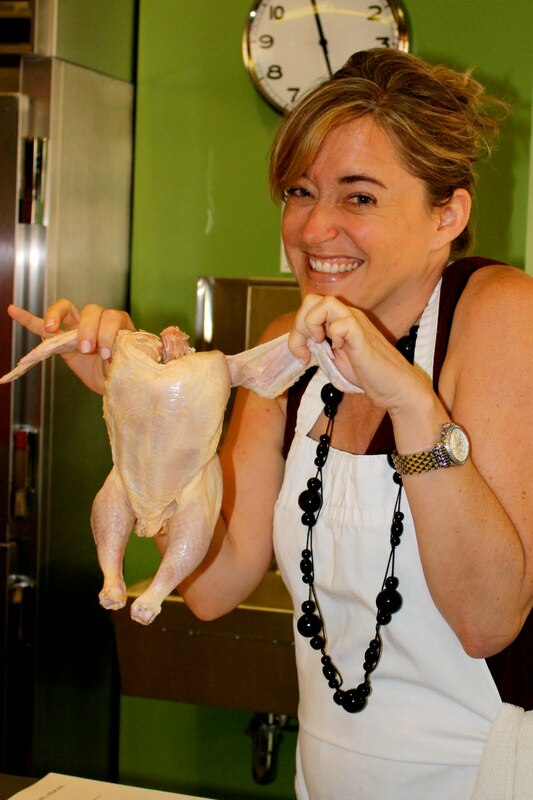 I can deal with a whole chicken if I am following close instructions via diagrams or video, but the minute I get overly confident and try to do it without help, it's a sad, grunting, messy, ugly affair.